This time of year I think of so many familiar flavors and sweet treats. Orange chocolate is one of them. So I made you some Homemade Orange Chocolate Bars. They are so delicious. Subtle hints of orange with creamy, melt in your mouth chocolate. 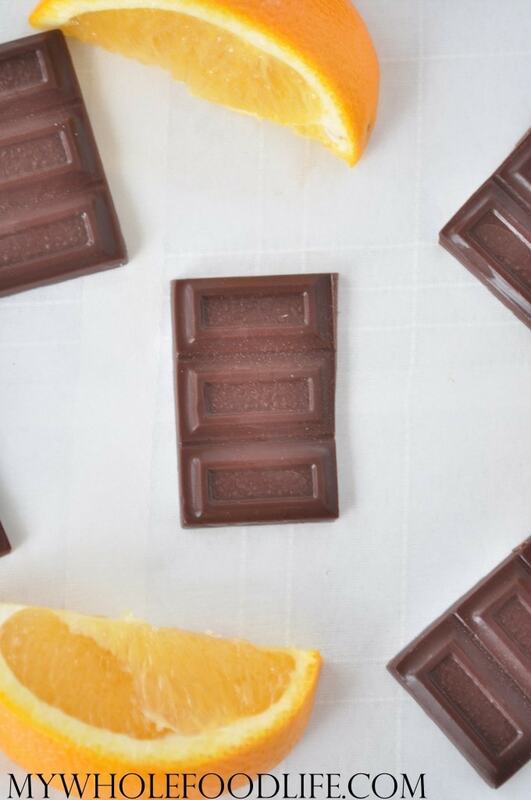 It was hard to stop eating these Homemade Orange Chocolate Bars! They are super easy to make too. Just 4 simple ingredients! This recipe is super simple! It’s a great alternative for those who are allergic to dairy. 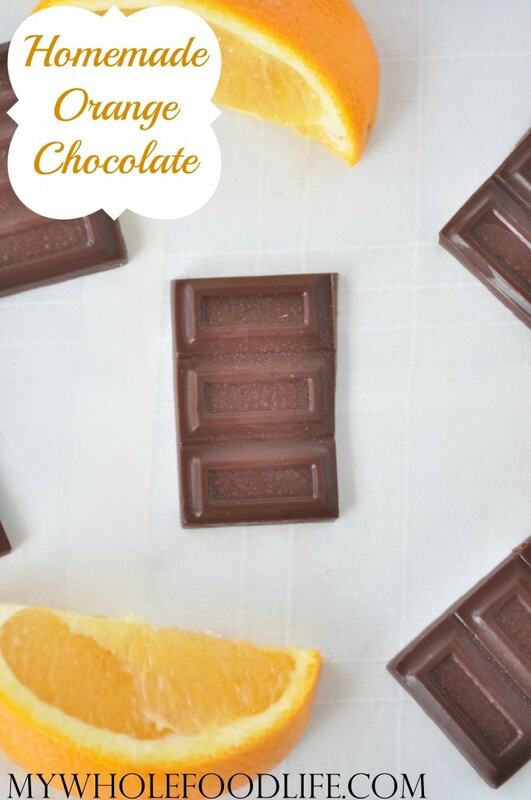 These homemade orange chocolate bars are vegan, gluten free and even paleo friendly! For more holiday treats you can check out this post. Make your own dairy free chocolate in minutes! Mix all the ingredients in one bowl . Whisk together very well so there are no lumps. Pour into chocolate molds and place in the freezer. They should be ready to eat in about 30 minutes. Please keep this chocolate in the freezer. It melts rather quickly once it's out. Enjoy! Thank you for sharing this! I just started making my own chocolate a few weeks ago and my family ADORES it. I haven't used coconut oil yet, but I heard you could. Because it has a lower melting point, though, it melts at room temperature quicker. I have been using cocoa butter, since it doesn't melt until 98 degrees. I have added cacao nibs as well and a little maca powder. I think trying syrup instead of honey will be a fun thing for me. I LOVE that you can make your own HEALTHY chocolate that I'm not afraid to give to my kids! But I'm looking forward to trying this recipe. Thank you so much!! woww! exactly what i have been looking for, simple and perfect can i use anyother oil, since my recent experience with coconut oil turned out quite bad (not this recipe though) the chocolate tasted and smelled of nothing but coconut any tips? Crisco coconut oil has no odor or flavor. Could you use other flavors in this? Yes! I think peppermint will work good too. Wow! This stuff is amazing! I pinned it the day you posted and was able to get some orange extract this weekend. Just mixed it up. I use a lined mini muffin tin to make mine and they are in the freezer now. I could not stop licking the bowl. I can't believe how easy this is to make. And I can't wait to try other extracts. So do you think cocoa butter would work as well? I bought some and haven't used it yet. I'll be making this a lot. Yum! So glad you liked it! I think cocoa butter should work in this too. I have made these with peppermint extract also. So yummy! Is it possible to use orange juice instead of orange extract? I think maybe if you used a tiny amount? I think you can use orange zest instead just multiply the amount of zest by 2 since the extract is very concentrated. (Example 1tsp of zest= half a tbs of extract) I'm gonna make it this way wen i get the ingredients n___n since i did not find the extract yet. Hope this helps-take care! Does the "T" measurement for the maple syrup stand for tablespoons? Thanks! :D Was wondering if you think replacing maple syrup with agave would screw up the recipe?